Director Richard Linklater has made a career of creating slice-of-life movies which take place over a short period of time. (The exception, of course, being his 2014 film, Boyhood.) Beginning with his early feature Slacker, Linklater has shown a penchant for focusing on a small group of characters, sometimes just two as in his Before trilogy, and exploring their activities, without delving too deeply into a story. 1993's Dazed and Confused drew Linklater early attention, as it was set in the 1970s and explored one day in the life of a group of Texas high school students. Now, 23 years later, Linklater doesn't bring us a sequel to that movie which helped to make Matthew McConaughey a star, but, instead, delivers what can be considered a spiritual successor with Everybody Wants Some!!. It's August, 1980, and freshman Jake (Blake Jenner) arrives on campus at a Texas college. He goes to the house set aside for baseball players and meets his teammates -- McReynolds (Taylor Hoechlin), Finnegan (Glenn Powell), Nesbit (Austin Amelio), Plummer (Temple Baker), Dale (J. Quinton Johnson), Roper (Ryan Guzman), Willoughby (Wyatt Russell), Beuter (Will Brittain), and Jay (Juston Street). Over the next three days, Jake will be introduced not only to college life, but life as a college baseball player. He will get to know his housemates and then peculiarities, attend parties, meet a girl, and play some baseball. That synopsis may seem sparse, but that's what you get with Linklater's personal films. The emphasis is not on the story or any sort of plot development or twists. The goal is to follow a character or group of characters as they go about their lives. It's not a documentary, but it truly epitomizes a "slice of life" movie. We meet the characters, get enough information to tell them apart, and then watch them do their thing. As noted above, Linklater has done this before, and the goal in Everybody Wants Some!! is to turn a spotlight on several different elements. First of all, we get a look at college life. We can assume that this is Jake's first time away from home and he's experiencing what it's like to suddenly have so much freedom and be faced with so many choices. Next, the movie focuses on athletes. Baseball players are certainly a different breed and we see how the mixture of camaraderie and competition shapes the relationships between the guys. Lastly, the film is set in 1980, and Linklater gives us a nice dose of what life was like then. Not only do we hear music from that era, we see the various trends going on at that time (disco, cowboy bars, punk). Also, Jake’s attempts to meet a girl remind us what life was like before things like Facebook. So, what we get from Everybody Wants Some!! is a snapshot not only of a weekend in 1980, but in the lives of these characters. Something like this has the possibility of being boring or even unwatchable. Again, the movie doesn’t have a true “plot” and I can see how this would be off-putting to some. However, Linklater has made a career of this and instead of putting the emphasis on story, he allows the characters to carry the film. The fact that we are introduced to an entire baseball team allows diversity with the characters (with the expected stereotypes) and the first thirty minutes spends time letting each player show off their unique traits. From there, we follow them through various situations -- parties, nightclubs, practice -- and we see how they each approach it. The nearly 2-hour running time is pushing things a bit, but it also allows Linklater to show things from various angles. The promotional material for Everybody Wants Some!! suggests that it may be a sequel to Dazed and Confused. However, this is a stand-alone film. 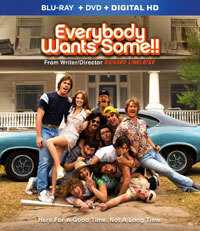 As with that film, Everybody Wants Some!! does focus on a group of young men who live in Texas, but we don’t get any of the same characters. Also, both movies take a very honest look at how young men can act, warts and all. Everybody Wants Some!! may take some liberties with college life, as it shoves a lot of experiences into one weekend, but I did like how Jake’s eyes were opened to meeting new and different people in college. The movie contains some funny moments and while the guys are often obnoxious, the film feels genuine at times. Don’t expect a mind-blowing experience with Everybody Wants Some! !, but if you’ve liked Linklater’s other works, then you’ll find something to like here. Everybody Wants Some!! has some very old looking college students on Blu-ray Disc courtesy of Paramount Home Entertainment. The film has been letterboxed at 1.78:1 and the Disc contains an AVC 1080p HD tranfsfer which runs at an average of 34 Mbps. The image is notably sharp and clear, showing no perceptible grain and no defects from the source materials. Linklater has shot the film in a very natural styles, which allows the colors to really stand out. The image is never overly dark or bright. The level of detail is impressive and the actors clearly stand out from the backgrounds. The Disc carries a DTS-HD Master Audio 5.1 track which runs at 48 kHz and an average of 3.8 Mbps. The track provides clear dialogue and sound effects. The film is filled with classic rock music, which sounds very good. The party and club scenes are littered with stereo and surround effects, as the music and crowd sounds fill the speakers. The Everybody Wants Some!! Blu-ray Disc contains an assortment of extras which are just as laid back as the movie. "Everybody Wants Some!! More Stuff That's Not In The Movie" (25 minutes) is a reel of outtakes, alternate takes and deleted scenes from all over the film where we learn that the shooting title was "That's What I'm Talking About". "Rickipedia" (4 minutes) has the actors talking about how Linklater is an expert on everything and has a vast wealth of knowledge. "Baseball Players Can Dance" (7 minutes) examines how the cast had to learn how to play baseball...and they also had to learn how to dance for the party and club scenes. This piece takes us into the dance studio to see rehearsal. "Skills Videos" (5 minutes) has various actors sharing the videos which they made as part of their audition process. These show them playing baseball. The hairstyles and wardrobe are examined in "History 101: Stylin' the 80s" (4 minutes), and we get to see the actors in the makeup trailer.